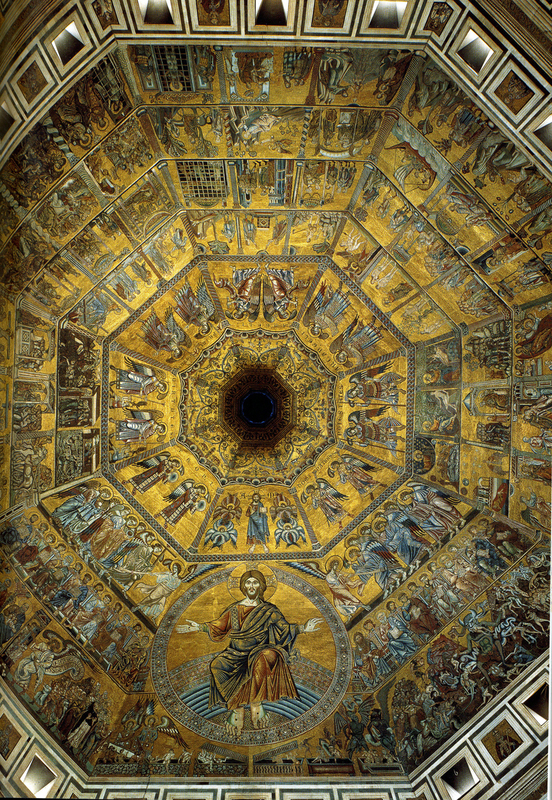 Few buildings in Florence have as much significance to the life of the city as the Baptistry. 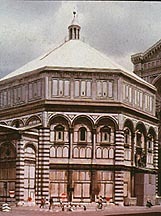 Opposite the west facade of the Duomo, the Baptistry is at the religious center of Florence. The building was dedicated to St. John the Baptist, the patron saint of Florence. It is in this building up until recent years that every Florentine citizen received the sacrament of Baptism. This building is thus critical in the religious and social identity of the city.The current building was probably built between 1059 and 1150 , and it is an excellent example of Tuscan Romanesque architecture. In the thirteenth century, it was believed that the building was built as early as the mid-sixth century and had been designed as a copy of Lateran Baptistry in Rome, the most important baptistry in Christendom. Another legend, developed during the thirteenth and fourteenth century, traced the foundation of the Baptistry back to a Roman temple of Mars that was subsequently rededicated to St. John the Baptist. The Baptistry was thus the principal monument in Florence associated with the ancient Roman foundation of the city. Eastern Door, 1425-52 in situNotice that the viewers have to look up to see some of the panels. 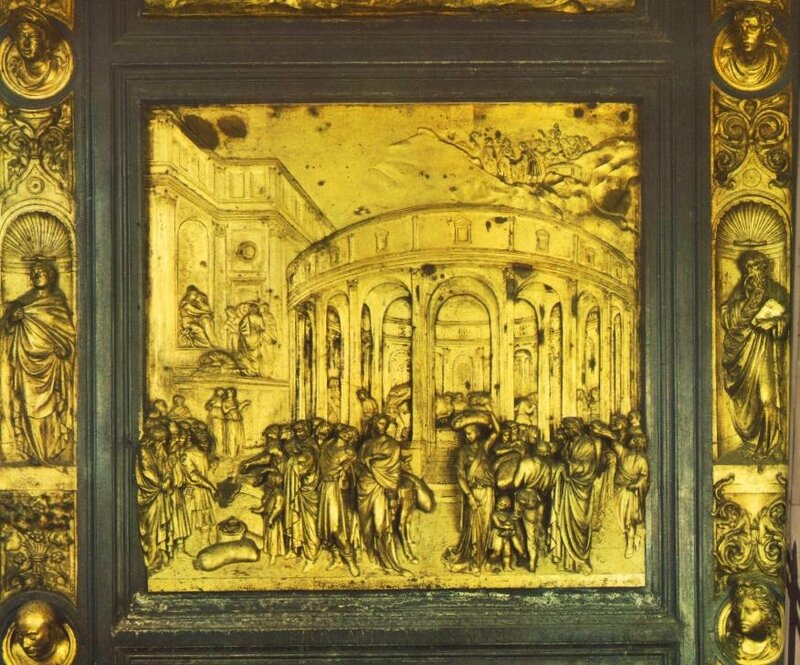 In the section below is a discussion of how Ghiberti distorts the image to compensate for the viewer's point of view just like in Donatello's St. Mark. 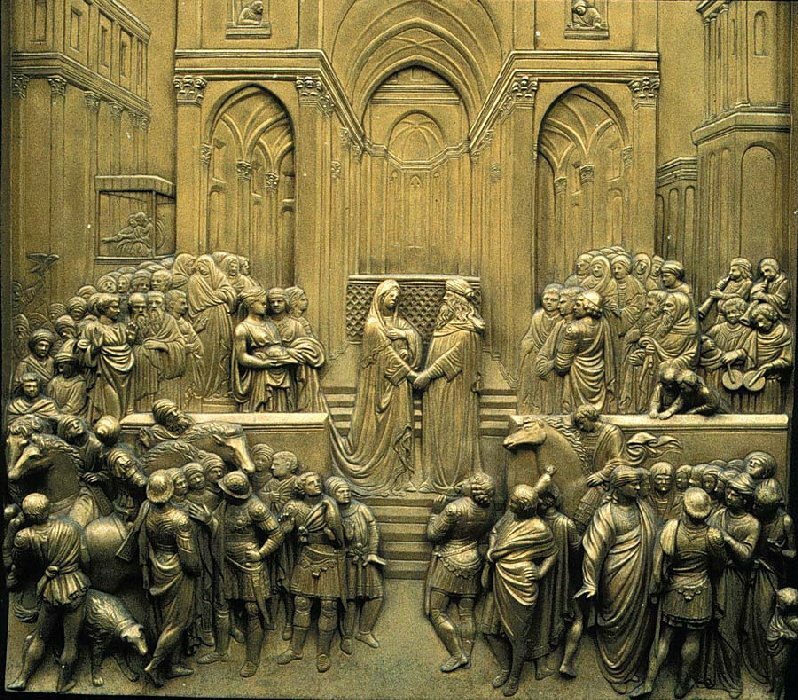 Stokstad states that Ghiberti was the winner, but, I read in a tour book that both Brunelleschi and Ghiberti won the commission and were expected to share it. The tour book explained that Brunelleschi was a sore loser and gave up the commission so that he wouldn't have to work with Ghiberti. At the beginning of the fourteenth century, the Arte del Calimala initiated another major project: the creation of three magnificent, bronze entrance doors for building. In 1330, Andrea Pisano (c. 1290-1348) was commissioned to do the first set of doors on the south side. Pisano completed the project in 1336:An economic crash between 1339 to 1346, political upheaval, and the outbreak of the Black Death in 1348 led to the suspension of plans to complete the two remaining doors. During the winter of 1400 - 1401, the consuls of the Calimala decided to open a competition for another set of doors. These were originally intended for the East door. These doors, facing the west entrance of the Duomo, were the most important doors. Just as the competition was initiated Milanese troops under the leadership of Gian Galeazzo Visconti were threatening Florence. Some see the motivation of the Calimala to revive the door project as an attempt to bolster civic unity and pride by embellishing one of the city's most important monuments. 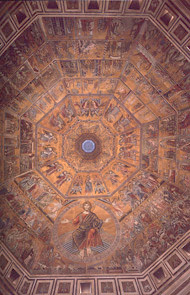 Another factor frequently cited for initiating the competition was Calimala's rivalry with the Arte della Lana, the Woolworkers Guild, which was given authority over the fabric of the Duomo. The Arte della Lana was at that moment engaged in the project of decorating the west facade of the Duomo, directly opposite the east entrance of the Baptistry. This combination of factors -- the history of the building, the Arte del Calimala's patronage, the fame of Andrea Pisano's doors-- made this an extremely desirable commission. 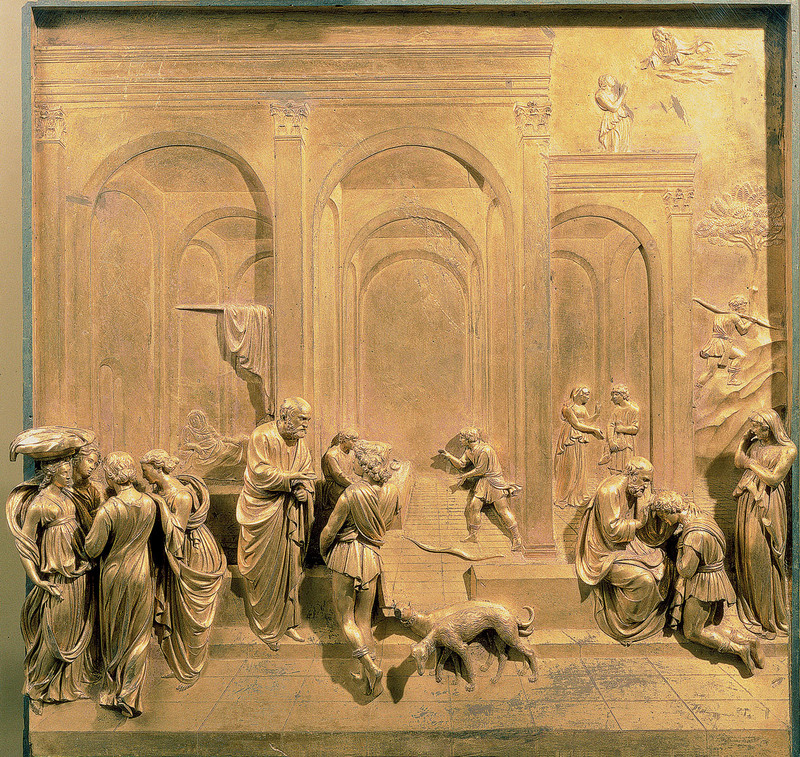 As stated by Richard Krautheimer (Lorenzo Ghiberti, p. 34): "The most important group of patrons in Florence called for a trial piece for the new bronze door which would eventually decorate the most illustrious building in the city and which would, besides, have the privilege of standing alongside the only important bronze sculpture theretofore produced in Florence." The competitors were expected to submit panels representing the Old Testament story of the Abraham's Sacrifice of Isaac. It depicts the moment when Abraham, ordered by God to sacrifice his only son, is about to plunge the knife into Isaac's neck, but his hand is stayed at the last moment by an angel. This story of divine deliverance would undoubtedly have resonated with Florentines, whose city had been delivered by the sudden death Gian Galeazzo Visconti in September of 1402. 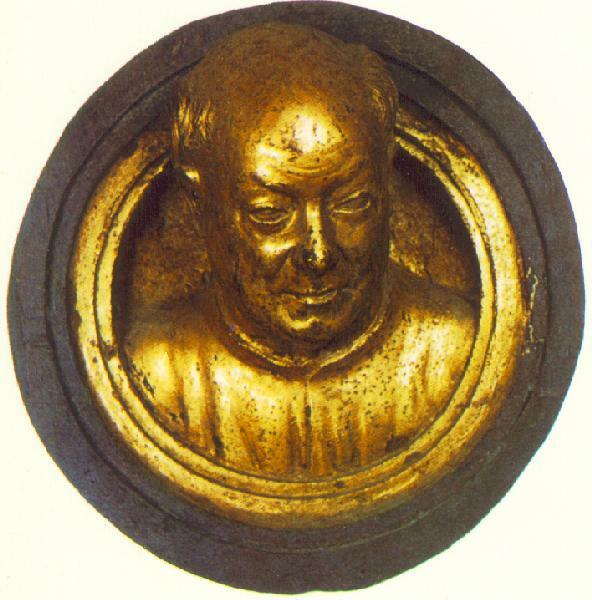 Ghiberti in his account of the competition records the name of seven competitors, all from Tuscany: Filippo Brunelleschi, Lorenzo Ghiberti, Jacopo della Quercia, Simone da Colle, Niccolò d'Arezzo, Niccolò di Pietro Lamberti, and Francesco di Valdambrino. Two of the competition panels have been preserved: one by Lorenzo Ghiberti and the other by Filippo Brunelleschi. 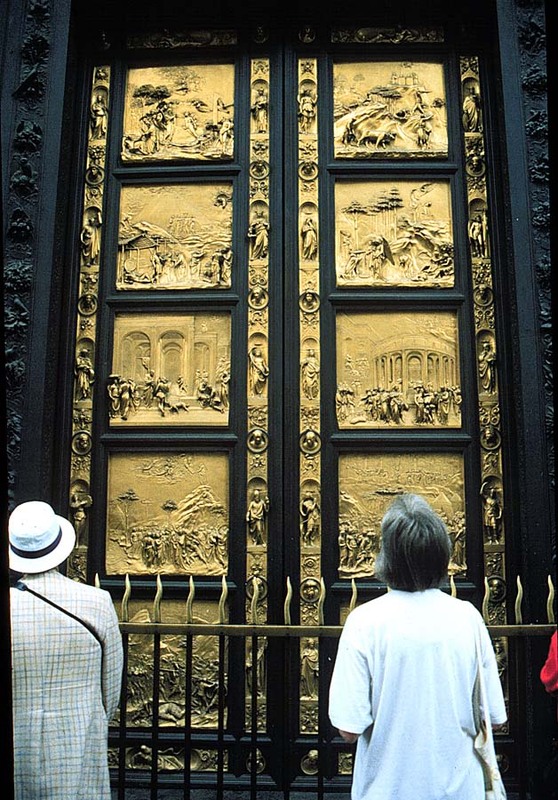 A semiotic or structuralist analysisThe diagram below explains that Ghiberti actually had "program" or design for the creation and flow of the overall narrative associated with the doors very similar in nature to the way in which Giotto arranged the Arena Chapel. The arrangement of the panels actually adds to the overall door's meaning. In order to better understand this art historians use a the same theory that literary analysts do to study the interrelationship of the stories or narratives. This kind of analysis is called a semiotic or structural analysis. By looking at this wall as a whole, and interpreting the relationship of panel image to the others, it is possible to come up with a deeper understanding of the set of frescoes as a whole. In this case the overall meaning of the Doors relate to their function as portals into the Church and therefore into heaven. The order and theme of the doors narrative relates to the Catholic conception of a spiritual journey to heaven. 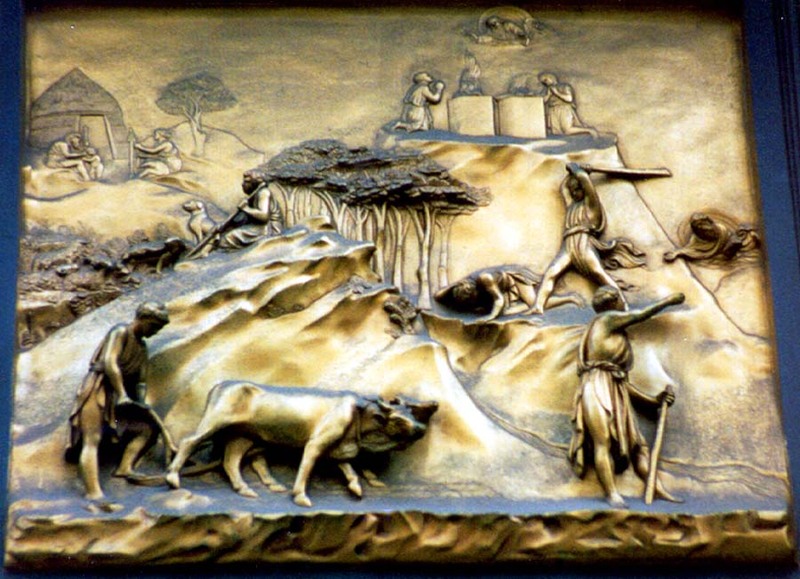 For example, the top set of images represents scenes from the Old Testament. The main themes are expulsion and sin. This refers to our "original sin" and how we lost heaven. Next we are saved through a renewed compact or covenant with God. 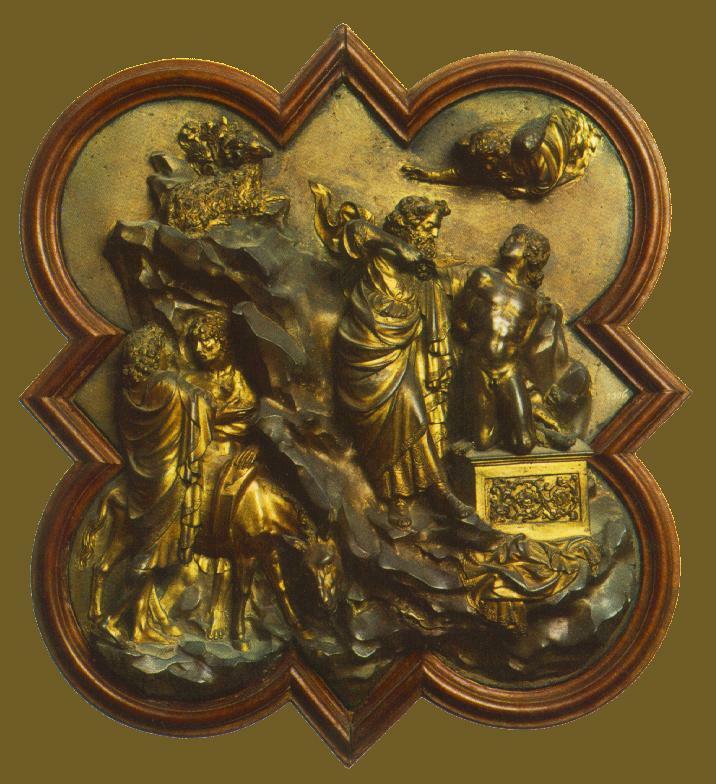 The central panels define and explain the covenant. This top set of scenes acts as a kind of thematic framework in which to view spiritual life and our journey. They are almost parallel to the early Christian conception of the typological exegesis from the Sarcophagus of Junius Bassus c359 CE. Beneath these stories and surrounding them are depictions of prophets who guide us and the Kings from the Old Testament who have established the foundation that all this is built on. This foundation is very similar in content and structure to thecaryatids from the Acropolis and the seven virtues and vices from the Arena Chapel. An interesting little detail is that Ghiberti gives himself a little cameo appearance on the doors almost like the donors form the outer framework of Masaccio's Trinity with Donors. 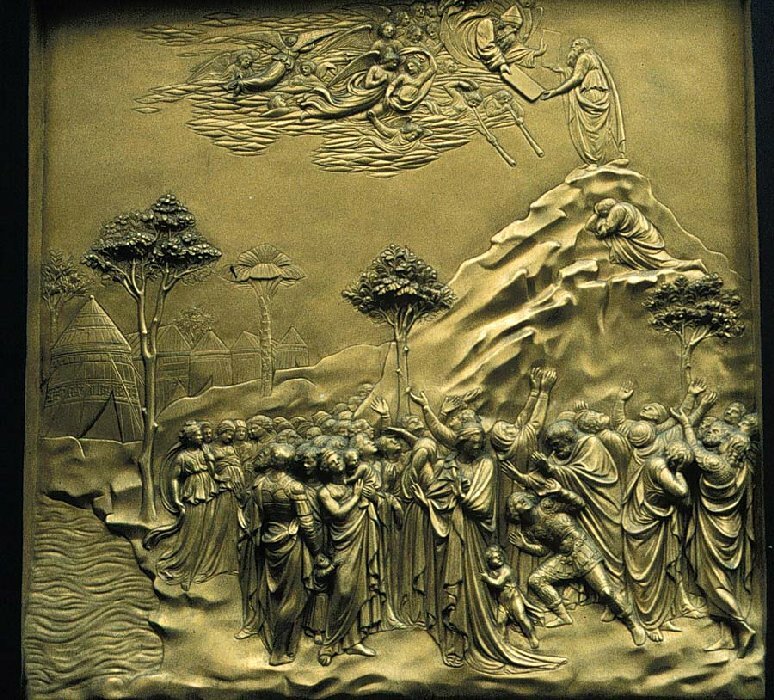 Form: Points of view are very important in Ghiberti's work in the same way that they are in Donatello's. 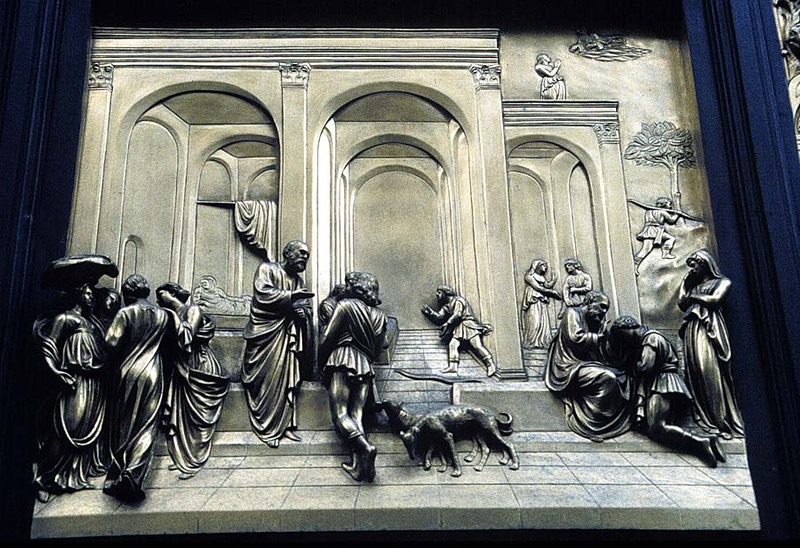 In fact, Stokstad places Donatello's The Feast of Herod right next to Ghiberti's Jacob and Essau. Stokstad gives a fantastic formal analysis of Donatello's The Feast of Herod in her book and Ghiberti's panel shares a lot in common with it. The most important formal point I think you should know is that linear perspective is introduced into relief sculpture. Stokstad even describes the varying levels of relief as a way of creating depth, which is not unlike linear perspective. A good example of this is in the Ara Pacis in Rome. 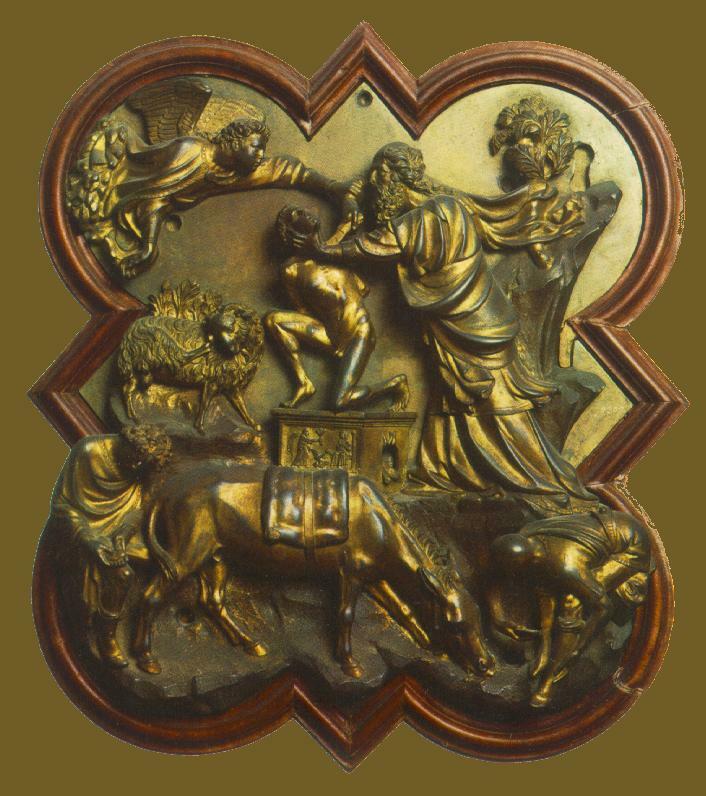 Like Donatello's St. Mark this panel is designed to be viewed from a specific point of view. Notice how the image on the top has been photographed from a point of view in which the viewer is looking at the work on the same level with the sculpture. The image below is taken from below as the sculpture would have been seen in its original context. Notice how the image on on top feels imbalanced and the head is a little too large and placed oddly. The figures are actually leaning out at the top and lower relief at their bottoms. However, when you look at the image in the way that it was supposed to be viewed it looks correct. This is because Renaissance artists like Donatello and Ghiberti compensated for the viewer's point of view or perspective when creating works of art. Overall, the image uses linear perspective to unify the image but still uses some of the old traditional tools of the continuous narrative that we see in Nicola Pisano's Nativity and Masaccio's work. Iconography: Symbolically speaking this image is packed with all kinds of different perspectives. It's almost a shopping list of ideas. The classical and platonic ideas are evidenced in the architectural structures in the image, the contrapposto poses and the uses of wet drapery. The humanist and theological/Catholic point of view is expressed partially by the Bible passage about Jacob and Essau in Liaisons 15-21 (Selections from Genesis-Jacob and Esau) which describes a story in which Jacob who has wronged his older brother must work hard to win back his good graces, like Jesus, Essau forgives his brother and invites him back into the family. Here again is a typological exegesis but with a very humanistic bent. We can imagine how it might have felt to be either character. The linear perspective is both a formal device, which creates space, and a way of including the viewer. The fact that the use of linear perspective is used actually symbolizes that the real theological and humanistic subject of the relief. It is not just the story of "Jacob and Essau" but rather the Renaissance man's relationship to it and what he can learn from it. This leads us to discuss the various themes that are hidden within the obvious meaning behind the image: a message that to get into the kingdom of heaven one has to wrestle and work hard but that forgiveness is also a component.